Do not adjust your monitor! 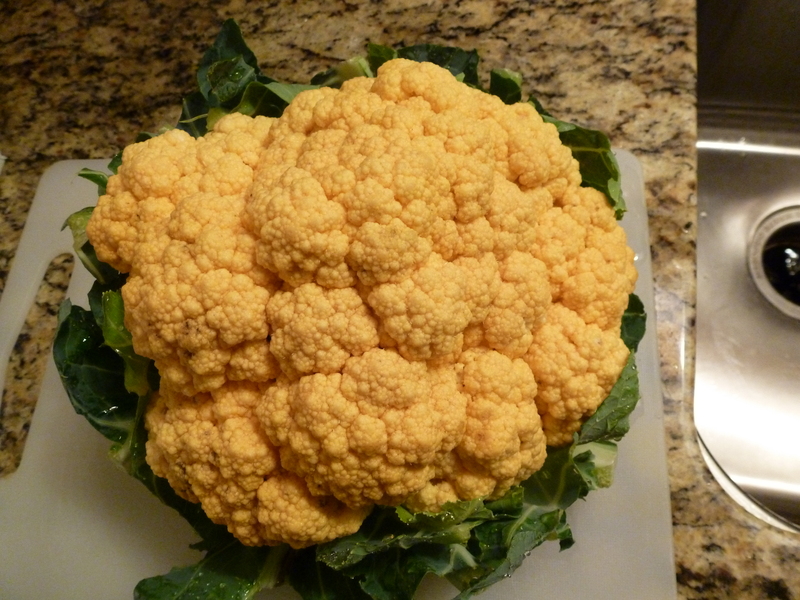 This cauliflower purchased at the St. Paul Farmer’s Market is an interesting orange-y gold! I’ve been seeing more and more varieties of vegetables in unique colours lately. Cauliflower that is orange, purple or bright green; purple potatoes; golden beets; and bright yellow carrots and tomatoes are becoming commonplace at the Farmer’s Market and grocery store. I don’t remember seeing these varieties much, just a year ago. I attribute this influx of vegetables in a new rainbow of colors to the masses becoming interested in growing and eating heirloom vegetable varieties and the local food movement gathering broader appeal. With all of the chatter among thoughtful eaters, people are becoming less suspicious of oddly shaped and uniquely coloured foods. We as eaters are learning that these characteristics often are accompanied by flavors that exceed those of red tomatoes of uniform colour and size; massive white turkey breasts, and eggs with white shells and pale yellow egg yolks in by immeasurable amounts. With a special-looking specimen like this golden cauliflower, I wanted it to play a starring role in what we made for our supper. At home, I have never done anything with cauliflower other that roast it, steam it or eat it raw. Recently, I sampled a truly delicious creamy, cheesy cauliflower soup at Heartland Restaurant in Saint Paul, and so for a weeknight meal my goal was to make a soup that was warming and delicious, but a little lower in calories and fat than the creamy-cheesy bowl of love from Heartland that I could never duplicate anyway. I followed some direction from Martha Stewart found in a recipe for Curried Roasted Cauliflower Soup on her website. * The results were good, but as expected, it was no match for the Heartland Cauliflower soup which elevated all expectations for what a cauliflower soup could be from the first spoonful. I am not a James Beard winning chef though, and I’m striving to be health conscious, so I’ll cut my soup some slack. It was a tasty and healthy meal. I started the soup by roasting the cauliflower. Martha Stewart’s recipe called for the cauliflower to be drizzled with olive oil and sprinkled with salt. I used some cooking spray so that the cauliflower wouldn’t stick, but skipped the oil and salt. The roasted cauliflower came out the oven with a similar colour and texture to macaroni and cheese. 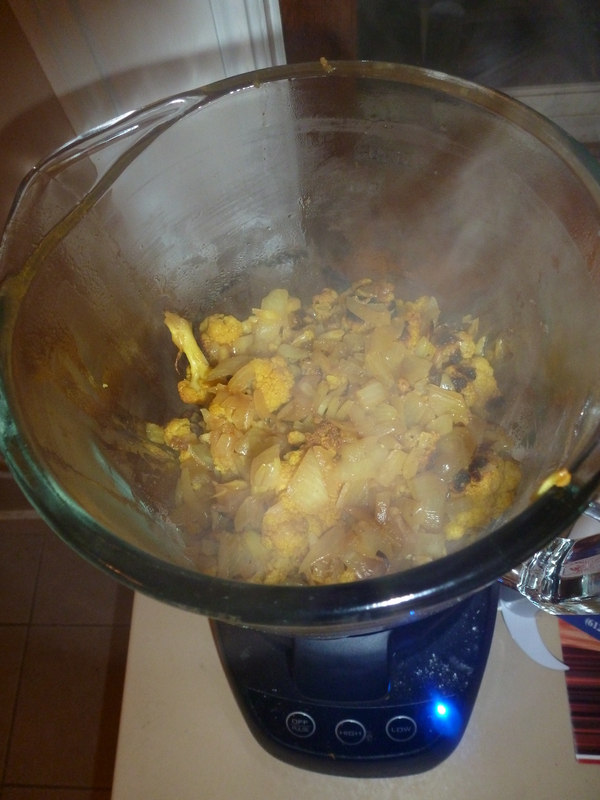 ** Next, I added the roasted cauliflower to a pan of sautéed onions. Again, I used cooking spray instead of the butter suggested by Martha, but followed her lead on adding curry powder and low sodium vegetable broth, water and chopped fresh parsley. I reserved a few of the best looking florets to top the soup, and gave the entire concoction a whirl in the blender to make it into a uniformly smooth consistency. We enjoyed this soup with some grainy brown bread toasted with tomato slices, 21 Seasoning Salute** and a little melted mozzarella cheese. 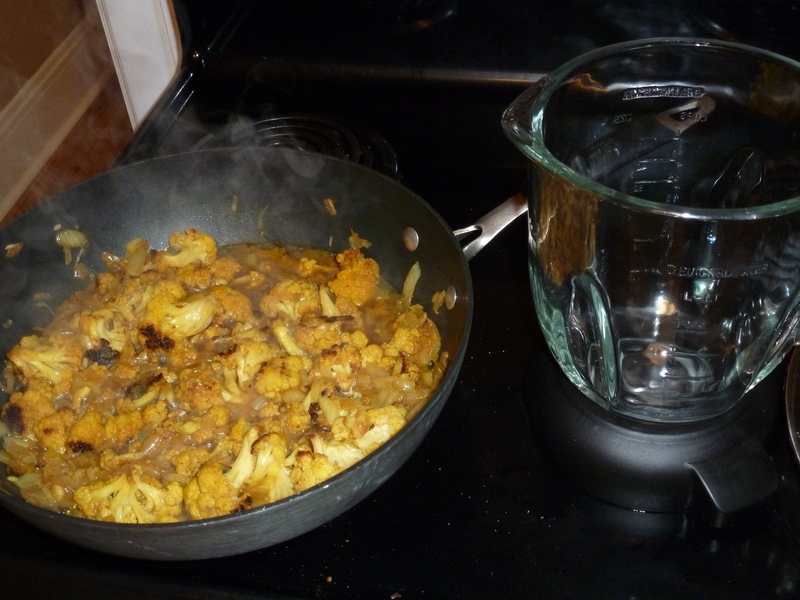 The curry added some kick, and helped to emphasize the golden colour of the cauliflower. It was a light but satisfying supper and there was enough for both of us to have a bowl re-warmed for lunch the next day. I’m sure we’ll make this soup again. *Say what you want about Martha. She’s got her name on books, magazines, a website and a TV show that have been downright influential to my wedding planning, home keeping, cooking and entertaining and her website is by far the most comprehensive, well-organized resource on these subjects out there. ***21 Seasoning Salute is a salt free assortment of dried herbs and spices from Trader Joe’s that is indispensable in our kitchen. 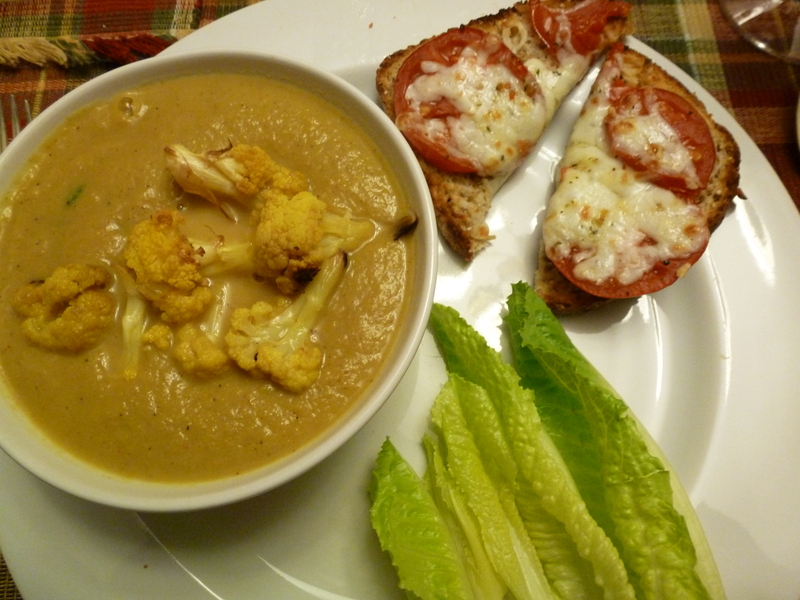 This entry was posted in Farmer's Market, Soup, Supper, Vegetarian and tagged brown bread, Curry, Golden Cauliflower, Heirloom vegetables, Lightened up, nonfat cooking spray, parsley, roasted Cauliflower, soup, toast, vegetable broth by Our Way to Eat. Bookmark the permalink. I would love to sit down to a bowl of your Roasted Cauliflower Soup with Curry and that sumptious looking sandwich! The collection of peppers and green beans at the top of the page looked like art.